Stone house is a stunning detached five bedroom family residence which has been constructed to the highest of standards and offers an abundance of space for a growing family. This truly impressive property encompasses a large private rear garden overlooking open farmland, garage and driveway parking. A grand hallway with a spectacular oak staircase leads to the first floor. From the hallway onto the imposing kitchen dinning family area which is undeniably the heart of this home. There is also the added luxury of a separate living room, useful utility and a cloakroom. The unique design / layout allows the master bedroom to have a private, direct stairway where you will find built in wardrobes and a generous en suite. All further bedrooms also benefit from built in wardrobes whilst bedroom two features an en suite. A contemporary bathroom and a fifth bedroom complete this desirable home. 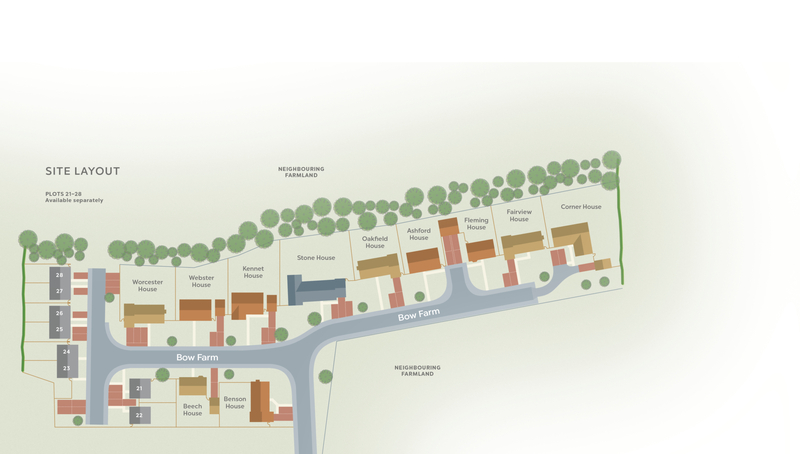 To register your interest in Stone House, Plot 32 and/or to arrange a viewing, click the button below and fill out the form. 6450mm x 4040mm 21'22" x 13'3"
6990mm x 4540mm 22'11" x 14'11"
6450mm x 3675mm 21'2" x 12'1"
3015mm x 2990mm 9'11" x 9'10"
6200mm x 3090mm 20'4" x 10'2"
6450mm x 4040mm 21'2" x 13'3"
3370mm x 3030mm 11'1" x 9'11"
4545mm x 3050mm 14'11" x 10'0"
2705mm x 1705mm 8'10" x 5'7"
4540mm x 3500mm 14'11" x 11'6"
3915mm x 3710mm 12'10" x 12'2"
3915mm x 3100mm 12'10" x 10'2"
3480mm x 1570mm 11'5" x 5'2"
Stone House, Plot 32 is part of the Bow Farm Phase Two development. For more information click the button below.